I am off to France today for a week’s break, so I am taking the lazy way out for this blog entry. 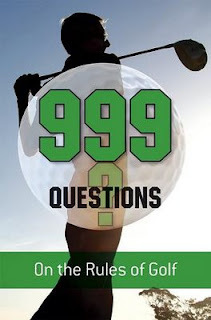 Here are five questions relating to the teeing ground taken from my book, ‘999 Questions on the Rules of Golf’, the sales of which are progressing well, especially in golf pro shops. If a ball, when not in play, is accidentally knocked off a tee, it may be re-teed without penalty. True or False? Answer: True. Rule 11-3. Note: When a ball is not yet in play on the teeing ground, and it moves without the player intending to make a stroke at it, it may be re-teed, without penalty. This applies even if the player moves it 100 yards down the fairway with a practice swing. Shane puts everything into his final drive on the 18th hole and as a result overbalances and kicks over one of the tee-markers. After dusting himself down his fellow competitor tells him that he has incurred a penalty for moving a fixed tee-marker. True or False? Answer: False. Decision 11-2/2. Note: There is no penalty for accidentally moving the tee-marker, which should be replaced. On the teeing ground a player may build a mound with loose soil to place his ball on, rather than using a tee. True or False? Answer: True. Rule 11-1. Note: When teeing his ball the player may create an irregularity of surface with sand or other natural substance. In stroke play, if a competitor plays from the wrong teeing ground he incurs a penalty of two strokes and must then play a ball from within the correct teeing ground. True or False? Answer: True. Rule 11-5. Note: The stroke from the wrong teeing ground, and any subsequent strokes made prior to the correction of the mistake, do not count in the player’s score. On the 14th hole Katelyn’s tee shot ricocheted off several trees and came to rest behind a tee-marker on the teeing ground of the 16th hole. Katelyn is not permitted to move the tee-marker before making her next stroke. True or False? Answer: False. Decision 11-2/1. Note: Tee-markers are deemed to be fixed when playing the first stroke with any ball from the teeing ground but are obstructions otherwise. I hope that you have learned something from the above. There are 994 more questions, answers, references and explanations on the Rules in my book. There are bound to be many nuggets in there that will save you strokes on the course and maybe even win you a match. At £12.99 ($19.99 / €14.99) it is good value and I will sign it and include the postal charges to anywhere in the world. Why not buy two (or more) copies? It makes a great gift for anyone that plays the great game that is golf. This is Rico again and I appreciate your reply regarding the flagstick! I was actually excited to learn the fact that it is a breach of rule. Anyway, I have a new question regarding the teeing ground and I hope you can help me out with this one. too. A player's tee shot ricocheted off a tree nearby and the ball comes to rest on the same teeing ground. A player then plays the ball as it lies from the teeing ground and this time it goes out of bounds. Under penalty of stroke and distance, can a player tee his ball from the same teeing ground since Rule 20-5 seems to apply? Yes, in my opinion, Rule 20-5a applies and the player may tee their ball.